Today was a really beautiful, happy auspicious day. Our dear sister Veena, who was quite ill with a dialysis related illness is recovering by the grace of Sai. 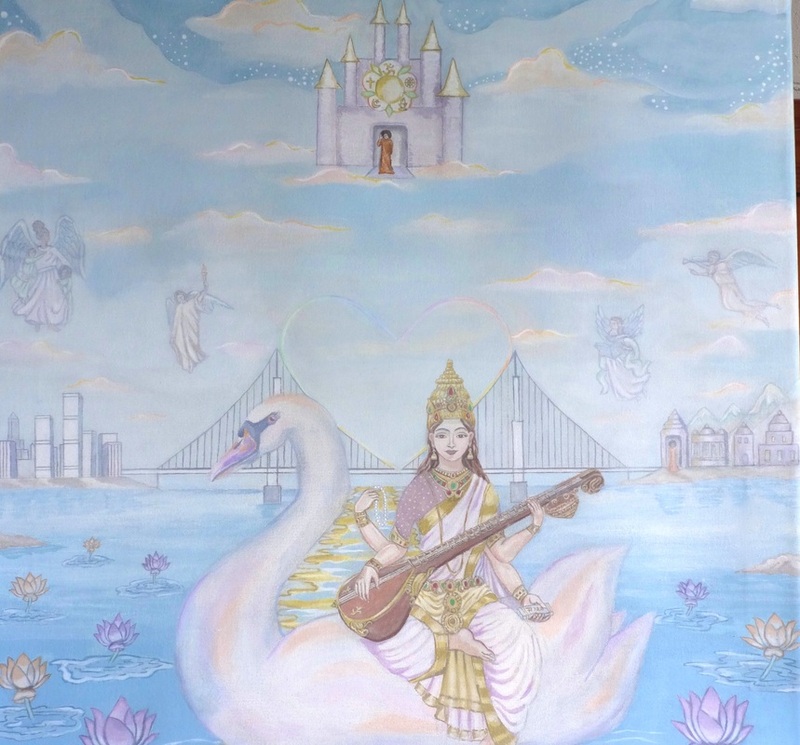 I also completed a painting I have been working on for about 6 months: "Ave Saraswati" perfect timing because it is the 8th day of Navarathri the Goddess, Divine Mother Festival. To top off all this goodness, David and I decided to go to a Paramahamsa Yogananda meditation at the Aquarian Dreams spiritual center. We entered the celestial purple and blue building just off of A1A in Melbourne. The meditation was lead and hosted by long time devotees of Paramahamsa Yogananda. As we made ourselves comfortable, to our sheer delight sister Sue Michaels came bubbling in. We hadn't seen our dear sister for quite some time making this a jubilant reunion. We all quieted down and prepared for the meditation. Our host started us of with those really melodious Paramahamsa chants "Door of my heart, open wide I keep for thee." After the chanting the host led us into the meditation. Before the meditation began David and I explored the Aquarian Dreams book nook. Immediately I spotted a book by Connie Shaw, a Sai Baba devotee. "I Wake up Laughing." I browsed through the book enjoying the wonderful interview exchanges between Connie and Sathya Sai Baba. One part caught my eye. In this portion of the book Sai Baba recommended chanting "Soham" while inhaling and exhaling deeply. And that we should be doing this 3575 (I am not sure of the exact number but it was up there) times per day. Another vision blossomed. I saw what appeared to be a clothesline with little packets of blessed rice or some sort of prasadam hanging from it. A divine being approached and took 2 packets off the line and said very distinctly: "This one is for Alex and this one is for Sean." The being was referring to my grandsons. There was one more vision where I saw Bhagavan Sathya Sai Baba, in a pure white robe holding something, not sure what in His holy hand. On the blue lotus feet of my Divine Mother. Divine Mother, O my Divine Mother!" the rest of the evening. We closed with everyone chanting Om and blessing ourselves and the whole world.